Like many of you, I am decidedly NOT attending this year's San Diego Comic-Con, but I am interested in what's going on there. Back in the day, you used to have to wait weeks or even months to hear about what happened, but these days, it's essentially real-time. The trick is, though, to figure out how to catch what's getting thrown out there. In years past, I've generally just tried to keep on my regular comics news feed channels. It essentially amounted to monitoring what I was already monitoring, but with a little more frequency. This year, I'm going to try to improve on that. Starting at the top of the first column is a feed pulling in any items that show up in Google's news search with the phrase "Comic-Con" in it. The + marks before each title show a brief summary, and clicking the link takes me over to the whole article. Beneath that is a Comics Alliance's RSS feed for anything they tag with "Conventions." I don't normally check their site, but they're one of the few comic sites I've found that separates out their feeds by different tags. Below that is a YouTube widget that's specifically pulling in the latest video from Things From Another World. They had some decent coverage last year, and I subscribe to their YouTube channel, but having it embedded here means there's one less place for me to check manually. 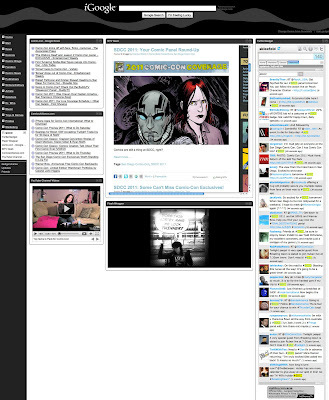 In the middle is an iframe embedded with the MTV Geek page dedicated to SDCC. They don't have a feed especially for the convention, and I'm particularly interested to see what they do this year. I track them through other channels as well, but I want to ensure I don't miss any of their con coverage. Below that is a widget that plays a slideshow of the most recent photos uploaded to Flickr and tagged with "Comic-Con". It always starts with the most recent, so I don't have to wait to see if anyone's uploaded something new. I can stop the slideshow at any point if there's a particularly enticing image I want to study more closely. On the far right is a Twitter gadget that I've defaulted to pulling in everything with the #SDCC hashtag. It's already been flying through Tweets faster than I can keep up, but I'm planning to use that more to get a sense of the atmosphere of the show. I've still got a separate Twitter client on my desktop to keep an eye on all the regular folks that I follow anyway. With the show just getting underway, there are definitely some other things I'm going to see if I can include if possible. The Sirius radio channel, once it starts later tonight, for example. There's supposedly a few other news feeds that will get started in the next day or so as well. 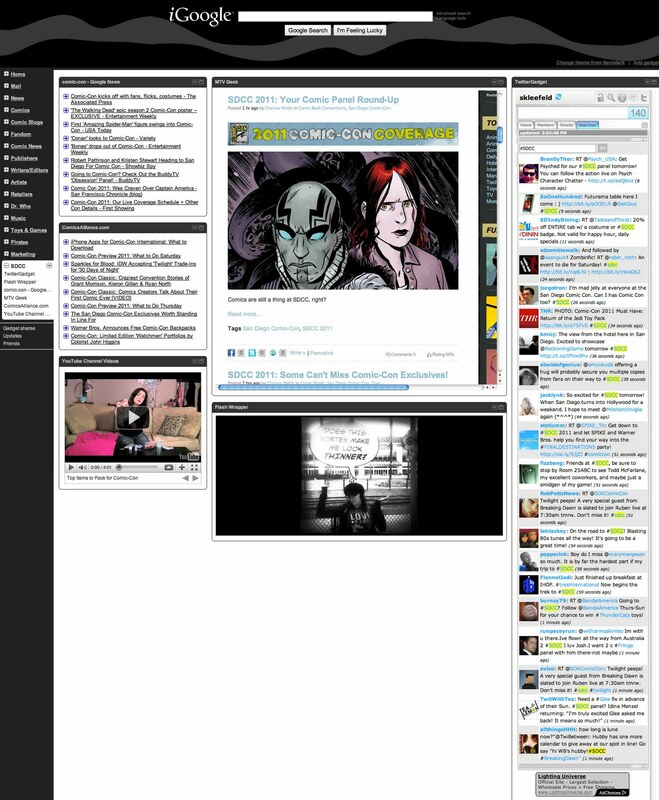 Like I said, too, this is all in addition to my existing monitoring of comic news. But I can keep this running through the next week or so, and delete it once the show ends. We'll see how that works.